Yemen: 2006. I’m the only woman in the room, I’m chewing qat for the first time, and I’m doing it wrong, masticating the tender green leaves into pulp and then swallowing, as though I’m eating salad greens. 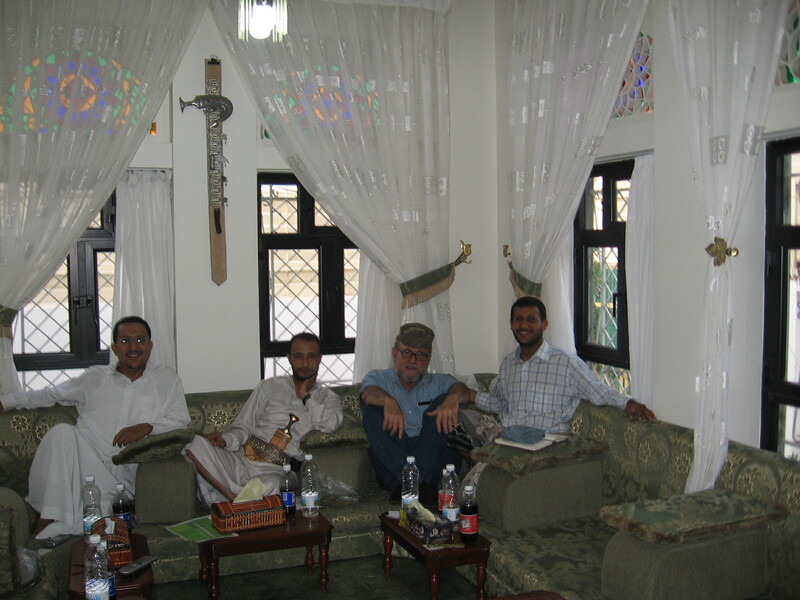 Despite my faux pas, such is the magic of Yemeni hospitality that I am feeling perfectly at home among strangers. My host, who I am meeting for the first time, has graciously invited me into his home as though I am a welcome guest rather than an intruder into a male sanctuary. “Just chew it a little and stuff it in your cheek, Judith. Don’t swallow it,” he patiently explains. I’m here because Larry has fallen in love with Yemen, for the warmth of its people and its beauty, both natural and architectural. He’s the one who told me about the “Solomon Hour”, a magical time in the late afternoon, when Yemeni men and sometimes even Yemeni women chew qat, feel wise and view the large world with disinterested, affectionate equanimity. Special rooms, often with spectacular views are reserved for qat chews. According to Larry, a qat chew among friends is a civilizing ritual. I wanted to experience this for myself. Qat, the leaves of a shrub grown throughout Yemen, is a mild stimulant. I have yet to hear of qat inducing violence or other anti-social behavior. Qat seems to make the routine aggravations of the day assume their proper proportions. Life looks easier in the afternoon, which is when tell-tale cheek bulges appear on the faces of many men in the street. What appears to be a badly swollen jaw is really a thick wad of chewed qat, stuffed into one cheek. In a country where men don’t feel properly dressed for the street unless carrying some form of weapon, there’s much to be said in favor of a substance that promotes sociability and frees the mind from agitation. The best qat room I’ve seen so far is Dar-al-Hajar, the Imam’s palace, at Wadi Dhar. Built on top of a five story rock, it looks fantastical, like something placed by a show-off genie. The palace interior is both austere and magnificent: thick white walls, with irregular niches, stained glass windows, and winding staircases. The view from the qat room is spectacular, overlooking the entire wadi. Back in Khalid’s well-appointed qat room, we contemplate the latest installment of World Cup soccer on television. Instead of mountain vistas. I am surrounded by happy men, speaking in English for my benefit, and they are doing what comes naturally to men back home, namely talking about sports. France is playing Switzerland. Is America the only country in the world that doesn’t take soccer seriously? Back home in Washington DC, World Cup Soccer barely grazes my consciousness. Under the influence of qat I rise to my country’s defense, reminding everyone that America has a championionship women’s soccer team. Didn’t we beat Brazil? By now I have generated a healthy beginner’s wad in my right cheek. I feel clear headed, alert, and full of good-will. No distortions of time and distance, or ravenous hunger for junk food like a marijuana-induced high. It feels more like a strong dose of caffeine and nicotine without the coughing and the jitters. “Is this the Solomon Hour yet?” I ask. Dame Freya Stark, the famous British explorer wrote of experiencing, upon setting foot in Yemen a rich and novel sensation , namely happiness,” pure and immaterial; independent of affections and emotions…a delight so rare and impersonal that it seems scarcely terrestrial when it comes.” Perhaps this best describes the exaltation I felt waking up for the first time in Old Sana’a, to a cityscape like none I could have imagined. Each building looked hand-crafted. Every house, no matter how humble, half moon windows decorated with curvilinear designs and stained glass, or encased by intricate wood carvings. There seemed to be an acknowledgement that every day beauty was essential as food. The delight continued as we drove down to Aden, past smaller versions of Old Sana’a tucked into mountains. Everything man-made harmonized with the landscape. I contemplate the miracles of technology and friendship that have brought me to Yemen to chew qat, and conclude that life is full of unexpected pleasures. I think I’ve hit the Solomon Hour. This entry was posted in Blues, Cannibis Cooking, Existentialism, Humor, Literature, qat, women, Writer. Bookmark the permalink. I just commented about this on facebook. Thank you for sharing this with us, Judith. No words.